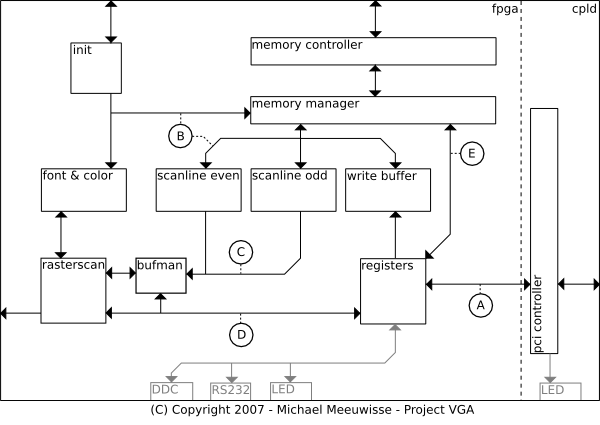 This is the website of Project VGA, a project which aims to develop a Low Budget, Open Source, VGA Compatible video card. Currently we're trying to be as open as we can - our goal is that you could build the card at home (and understand it) if you wanted to. Hopefully you'll be able to buy one though within a few months for under 200 euro from us! And did we mention it was reprogrammable? 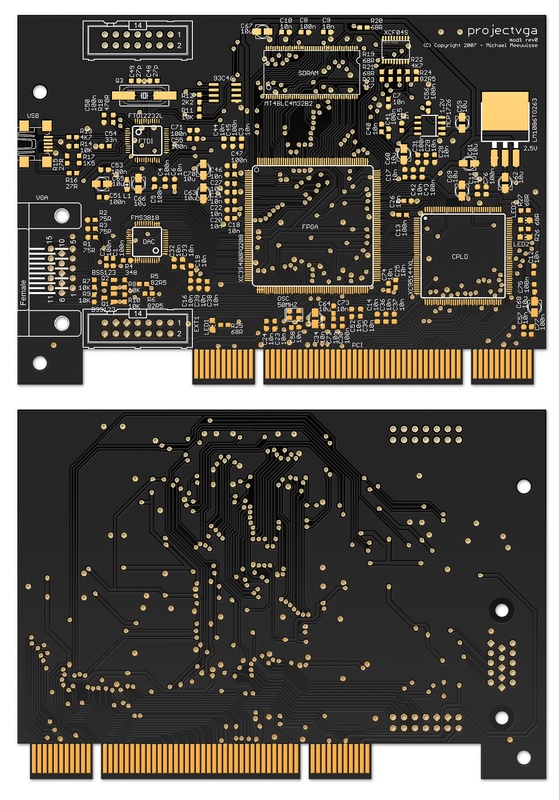 If you ever dreamed of playing with an FPGA, or building your own processor, this is the card you want! If you're looking for the license everything is released under the "GNU General Public License 3.0" after lengthy discussion and feedback from you guys! Not all documents reflect this yet though, we're working on it. 28 Feb: Let me know if you want your own prototype soon! 3 Dec: Moved to new server, thanks Reinder! Our motivation has been discussed in detail in the first entry, but we'll recap it here for clarity. The idea for this project came from the desire to play with programmable hardware in combination with the goals the Open Graphic Project set out. Due to some partial impatience from our side due to the progress that this project was making, and more importantly due to the hefty price tag the card in development will have, we started working on a lightweight version. Don't get us wrong - we'd love to have an OGD1 card and are amazed by it's specifications, but for us and a lot of people, this card is simply too much. So that's where this card comes in, to give you all the fun of developing on programmable hardware, designing video cards and architectures, for a price that won't hurt your wallet. On our long-term plan we'll hopefully meet up with the Open Graphics Project and be able to share certain components. 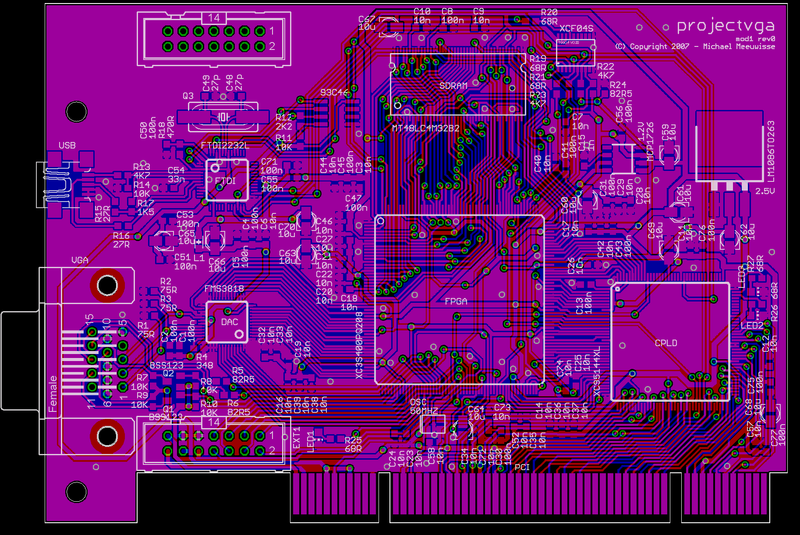 We're finished with routing the circuit board. 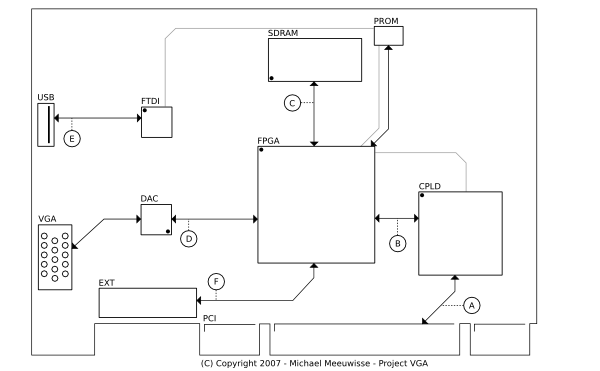 You can grab the latest version of the schematic, board and library here. It's created with Cadsoft Eagle. 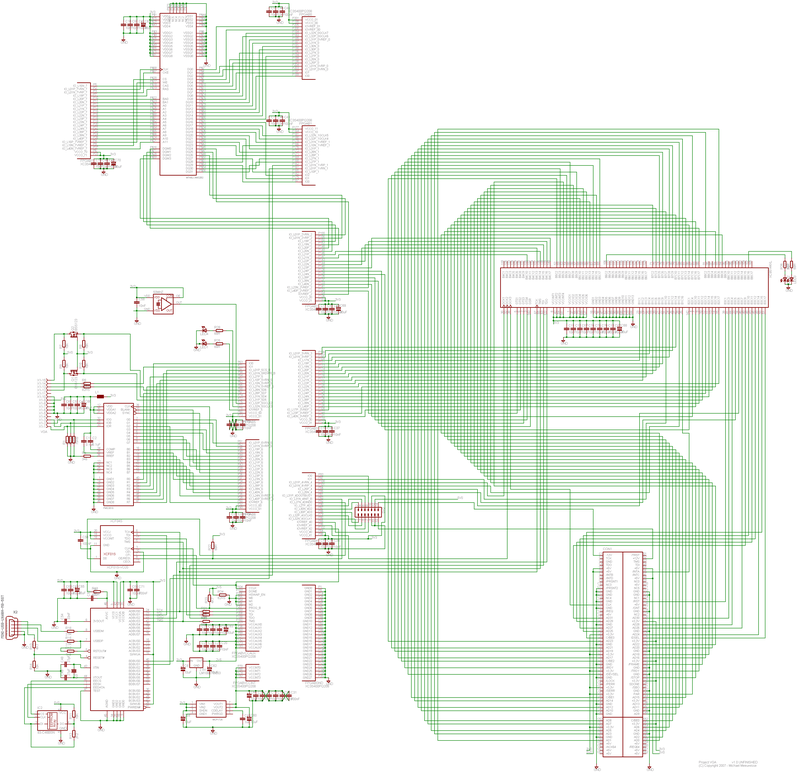 If you don't have Eagle and don't feel like installing it, have a look at a full-size PNG image of the schematic and of the circuit board. 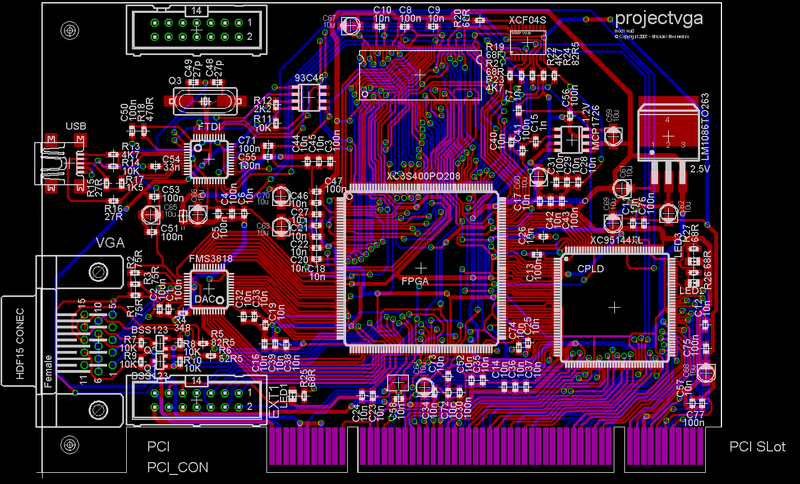 The first prototype PCB has just been assembled and we're currently testing it for any errors. We're a little busy with planning the steps after that, so stay tuned! You can find more information about everything on board as well as the other main components and why we ended up going for these in the project motivation. If you're curious how much all these parts cost, and which components you exactly need to build the card, check the parts list. And if you want to know how everything communicates with eachother, we've got that documented as well. You can find it in the communication description. I'm a student of the Institute of Information Technology and Computer Science at the Hogeschool van Amsterdam (the Netherlands) studying Technical Computer Science. They've generously given me the possibility and financial support to initiate this project and to develop this card as part of the Systems and Network Engineering course, which is completely English-taught and open for Exchange students. If you like the idea of studying for a semester in the Netherlands, why don't you look around or contact us? My 'official' weblog is located here where I ramble on about technical stuff that interests me, problems we should be able to live without, progress on personal projects, and heck, sometimes even some stuff that didn't happen on the net. More importantly though, if you want to stay up to date with this project, I suggest you keep an eye out on that page since all new information will appear there first! It's also where design choices will be discussed, plans will be plotted, and feedback is requested. See you there! A preliminary mailing list has been set up. You can subscribe, unsubscribe, or get help. Once you're subscribed you can send email messages to the list. An archive will hopefully soon be online. Also, an rss feed is now available. Comments posted here will periodically be archived to keep this page reasonably sized. To find older posts, see the entries on the left.